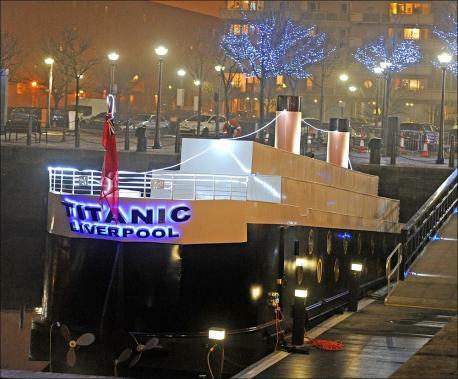 Well the hits keep on coming for the Titanic floating hotel in Liverpool. Both the Daily Echo and Crosby Herald report the discomfort it is giving locals and others. Remember you can post comments to these articles. The Grand Rapids Public Museum in Michigan is looking for Titanic enthusiasts to work at the upcoming Titanic exhibition in February. Both paid and volunteer positions will be available. For details on the jobs available, click here. Bubbles says it is not in poor taste, just a bit of fun, and already has bookings for it. Sorry Mr. Bubbles, but you are just trying to cash in on your own little Titanic niche. This is exactly what you wanted, free publicity for your three bed hotel. Okay enjoy it while it lasts but I suspect most people will see it exactly for what it is. A trashy way to make money over a tragedy where 1500 people lost their lives. 1. Titanic broke all kinds of box office records and dvd sales have generated millions in dvd sales. Of course all that money did not go into private hands. Government got a large share in taxes (in some case income but mostly sales taxes). Most governments do not brag about what taxed items bring in lots of money, China is proudly telling everyone that customs duties on Titanic dvds generated $33.7 million dollars. The surge, according to Xinhua, is due to increased numbers of foreign movies being imported. Of course imports are very controlled in the People’s Republic. There is only one authorized importer of foreign movies ( China Film Group Corp) and Beijing Customs is the only authorized channel for the foreign movie imports. Which explains why they are so adamant about controlling the Internet. Hard to tax a movie from YouTube (but you can shut off access to it). 2. Okay you have heard about Titanic cruises and dinners but what about sleeping in a floating hostel that is designed to look like a sinking ship? You can at at Liverpool’s Salthouse Dock,where the floating hostel has an uplifted stern and slanting porthole windows to give such an effect. Needless to say, it has drawn sharp criticism and its owner, Alfie Bubbles (yes, Bubbles) has refused comment on his soon-to-open Titanic Sinking Boutique Hotel. We can only hope it financially sinks. If Nixon could go to China, why not Titanic? Titanic:The Artifact Exhibition is in Shanghai and apparently drawing crowds and expecting up to 200,000 visitors before it closes. Decades ago this would be a novel thing but today gets just a mention in the international media. Perhaps they are in awe of the Titanic story. 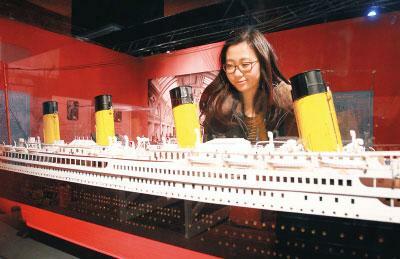 Then again a Chinese firm is building Titanic II so perhaps an exhibition puts it in perspective. 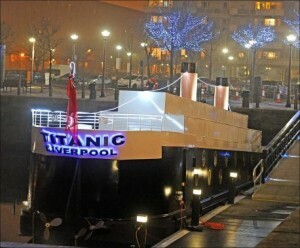 More dates are being announced for the upcoming Titanic II presentations. All of them were cancelled in 2012 due to Hurricane Sandy but Palmer is creating his own whirlwind. The New York event is going to be a gala with major celebrities and politicians in attendance. So you can expect the entertainment press to be all over it. But the real question everyone will ask is–will the actors that played Rose and Jack attend? The Belfast Telegraph is reporting that Titanic Belfast has become the most visited tourist attractions with over 650,000 people visiting in last nine months. 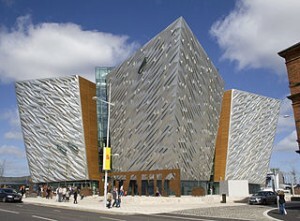 So many people wanted to see the Titanic visitor experience in December that staff had to put up “sold out” signs. 33,000 visited in December and that figure does not include the Victorian Father Christmas experience. Very impressive numbers indeed. Tim Husbands, Titanic Belfast chief executive said the numbers exceeded all expectations and proved Titanic was a year round attraction. “This was our first Christmas and also the first time we hosted a Christmas experience at Titanic Belfast, and almost 10,000 people visited our Victorian Christmas street scene to meet a traditional Father Christmas, and be transported back in time to a magical Christmas period,” Mr Husbands said. Stories about giant squids have been part of folklore and myth for a very long time. One was seen in 2006 but only after it had been caught and brought up. Japan’s National Science Museum, working with Japanese broadcaster NHK and Discovery Channel, have got actual film of a giant squid in Pacific Ocean. The squid was spotted at 2,000 feet from a submersible. The footage will air on 27 Jan 2013 at 10:00 p.m. EST on Discovery. Two photos accompany the story at Fox News. It is highly dubious to argue linking to news articles is copyright violation. Normally a copyright violation occurs when you substantially or in whole reprint an article without permission of its owner. No argument on that point but when you start demanding fees for merely linking to news articles, that is going too far. Here in the U.S., it is generally allowed to link to news articles without having to pay a fee to the copyright holder. This site is outside of Ireland and while they can send a bill to us, we can decline to pay and let the courts figure it out. It is a stupid policy and NNI ought to rescind it. Since they demand money for links, this site will no longer provide them. We will publish the paper name, date, and title of article and nothing else. The rest will be up to the reader. Anyone else want to comment on this policy? It is January so it is time for the annual ice carving competition at the Titanic Museum. Each contestant will work with 250 pound blocks of ice to carve their sculptures. Both professional and amateurs can participate in the event on 19 Jan at 9 a.m. Judges from the National Ice Carving Association will determine the winners at 3 p.m. The top prize is $2,000. The event is free to attend but entrance to the museum requires paid admission. You can get more information at TitanicPigeonForge.com.